Over the weekend, Gonzaga College (Washington, D.C.) and traditional juggernaut DeMatha Catholic (Hyattsville, Md.) gave fans the best ending to a football that has possibly ever been seen. Sunday night’s Capital Division Championship will go down in history after it looked as if DeMatha were on their way to a fifth WCAC title in six seasons. 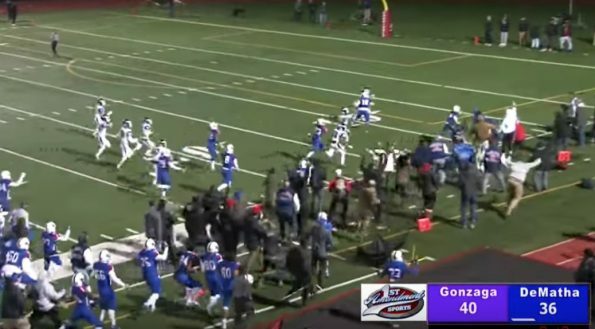 With 29 seconds to go, Gonzaga QB Caleb Williams threw a TD pass to Sam Sweeney , only for DeMatha’s Dominic Logan-Nealy to return the ensuing squibbed kickoff all the way to the house to re-take the lead at 43-40. Game still wasn’t done yet. With about 5 seconds to go, Williams fired a hail mary strike from his own 41-yard line on the final play of the game that found a teammate in the end zone, and pandemonium ensued.